If waking up in the wee hours of the morning isn't your thing, Saturn is now rising in the east at a reasonable time. Saturn rises at my observation spot in Northeast Ohio a little before 11 PM, as of mid-December 2007. Saturn's opposition will be on February 24th, 2008. Opposition is where the Earth is directly between the planet and the sun. Therefore, the planet will rise at sunset, and set at sunrise. At midnight it will be perfectly poised for observation. Opposition is also the time of its orbit when it will have the largest apparent size, and thus will give much greater views. Saturn will be in Leo this time of year, and should reach reasonable altitudes (a little less than 30 degrees altitude) at times around 1:30 AM. 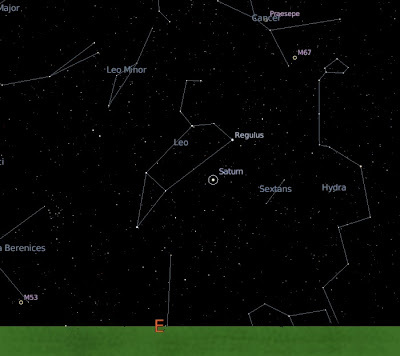 Look to the East, and within 30 degrees of the horizon before 1:30 AM. Find the sickle shaped group of stars. This is Leo's mane. The bright star at the bottom of the sickle shape is Regulus. Down and to the left of Regulus is another fairly bright star. This is Chertan. Saturn will be halfway down the line between Regulus and Chertan, and a little below it. Saturn is very bright, it will be hard to miss. Saturn is currently about magnitude 1. This is a little dimmer than normal, as we are viewing its rings close to edge-on. The closer the rings are to edge-on, the less light is relfected back to us. And although this will hide Saturn's beautiful rings from us, it may make it easier to see greater detail in the planet's disc.